Resident Astronomer Peggy and I will be there for some good dark night sky and some good tutorials in the daytime and plan to go after Pluto again. Now, just as I was going to get back to looking into what the "+" sign issue was all about, I got interrupted by Resident Astronomer Peggy because she could not use her Captioncall phone. Her hearing aid was in for repair and she wanted to use the phone that displays the callers voice as text, but the phone line was not working. After a bit of investigation, I found the problem. 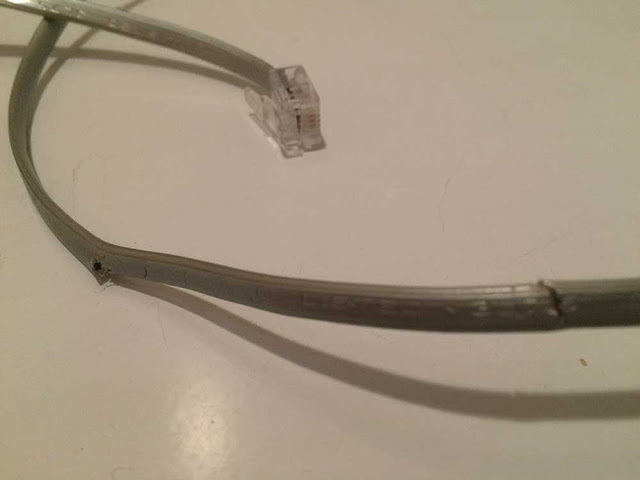 Check out this image of the phone cable. Now, once I saw how many times the cable outer covering had been broken and about how far apart the broken segments were spaced, I immediately suspected Astronomer Assistant Ruby had something to do with this occurrence. But what was I to do? I could actually measure the distance between breaks and then compare that distance to the width of her mouth, but, no, I did not really want to know the truth and to find her guilty, even though she could do with a little more training. So, I just chalked it up to her youth and went to Staples and got a replacement cable and got the Captioncall phone up and running. Finally, with that repair work out of the way, it was back to the mysterious "+" sign in the asteroid Ceres photos. Remember, that although the blinking test for Ceres worked just fine, there was a little dim object blinking around one of the reference stars. Could that little dim blinking object be a dim asteroid that just happened to be in that same view or what? See the magnified section screenshot below. As, I blinked from one image to the other, a little dim spot jumped from one side of the reference star to the other. Now, I had no idea why that little "+" sign was in the image and so went first of all to OCA Secretary and Author, Bob, and asked for his help. He immediately noticed that the star trails in the image did not show up on the "+" symbol and even in the right side photo, the star trails for the reference star seemed to be less but still there, but the mystery object didn't have trails. 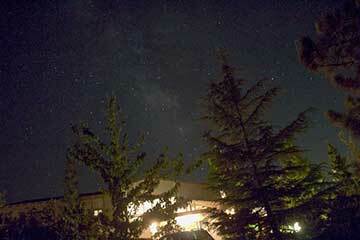 Notice also that there are quite a few other little dim dots in the images that don't have star trails either. 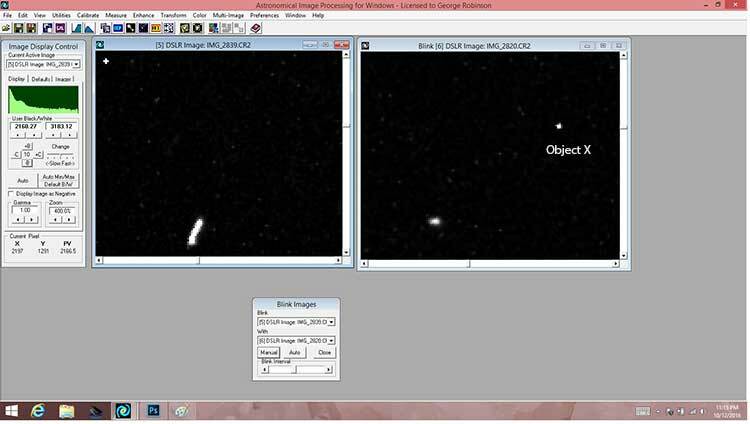 You can see that the image on the left did not have very good tracking, while the image on the right has better tracking control, but still the mystery objects didn't suffer much with trails. Well, I am just an amateur and my scope alignments are not always repeatable or perfect, so that maybe explains part of the problem. But, Bob's comments sent me off digging into what was going on. He also suggested that blinking is often done by more experienced amateurs with more than just two images so that if stray cosmic rays or other artefacts or UFOs are present in one image they won't likely be in one of the other images. Yes, that makes sense, too and that is another good lesson. Thanks for your help, Bob! Ok, so the mystery objects must be some sort of artefact and not real stellar objects. But, anyway I went ahead and measured the amount of light in each object using the AIP4WIN Star Image Tool and found them to be about 1.2 magnitude dimmer than Ceres. This magnitude measurement was made just for practice because the original images were not calibrated and I had not collected flat or dark images. I even went ahead and measured the RA and Dec of he Object X, even though I was beginning to recognize that the objects were not real. So, I next sent a note to the AIP4WIN software publishers, Willmann-Bell, and asked if maybe the "+" signs were introduced automatically for some reason and that I had just not read that section of the tutorial explaining what they were. I got a quick reply from Perry and Richard at Willman-Bell that really cleared everything up. First of all, they said the AIP4WIN software does not introduce or add the "+" symbol to the images. Well, I thought, maybe my Canon DSLR adds the symbols as metadata to indicate a hot pixel or something? It turns out that the "+" symbol is not really even a symbol, but instead Richard says it results from the interpolation process in the camera and that a hot pixel will be interpolated and spread over the immediate pixels surrounding the hot pixel. Wow, now I am beginning to realize that the "+" appearing in the images is not a symbol at all, but just the way the camera interpolates the image data and that a hot pixel can be distorted and can show up as something that looks like a "+" sign or a smeared out "+" sign. And guess what else I found when I examined the Object X under more magnification? Yes, that is right, it was a distorted and interpolated hot pixel too! So thanks to Bob, Perry and Richard the mystery is solved! There was no additional, serendipitous capture of a dim asteroid hiding at that location; there was no "+" symbol intentionally put there; maybe a cosmic ray, but there were probably just some hot pixels in the frame! I also discovered that my camera technique about viewing images using the LiveView screen, which continuously reads the camera image sensor and heats it up, which also tends to make the hot pixel problem worse, might not be the best photography technique. I like it because I find it much more fun and easier to look at the LiveView screen rather than look through an eyepiece, but that's just me and now I see it has its own tradeoffs. This whole episode has been one great learning experience. Each time we try to go a little deeper into doing astroimaging or astrometry we find a new lesson to be learned. I learned about taking multiple images for the blinking investigation, and learning how to measure the RA and Dec of an object by using the background stars and learning to be more diligent about ensuring the images are taken with the same exposure and writing the particular information down so that it can be clearly relied on when it comes to doing the analysis. I also plan to start checking out some more of the OCA Astroimagers Special Interest Group, where a whole bunch of much more experienced amateurs hang out and share successes and tricks of the trade.